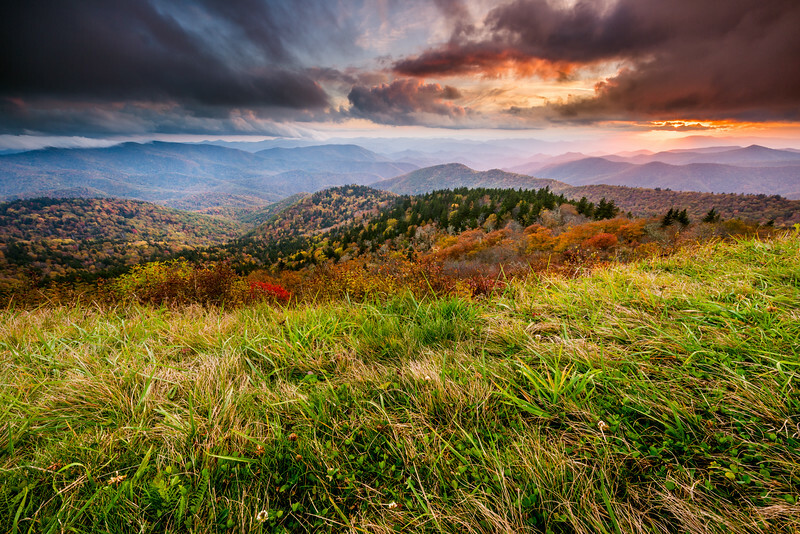 When I arrived at my favorite spot to catch a sunset on the parkway (Cowee Overlook) dark clouds loomed ominously over the mountains and there was a cold breeze swiftly blowing. As the evening went on the clouds began to break and I decided that I would try something different for this shot. I got my ultra wide lens out and laid on the ground with my tripod at its lowest level, Focused 1/3 into the scene, dialed in my settings, lowered my graduated into place and waited. In a fortunate stroke of serendipity the clouds began to break just as the sun dropped onto the horizon. I came away with one of my favorite shots that I have ever taken at Cowee.